Men's Sterling Silver and Leather Viking Bracelet from Bali, "Viking Compass"
Designed by Balinese artisan Henry Anthony Sanny, this men's bracelet brings a Viking spirit wherever it goes. 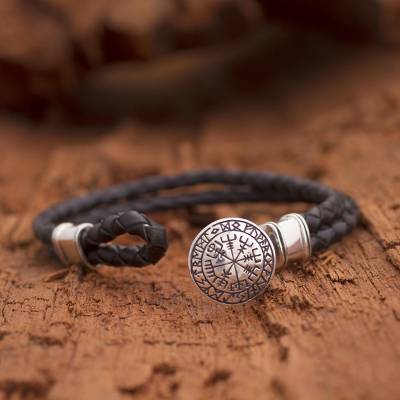 The bracelet circles the wrist with two cords of hand-braided black leather cord, centered by a sterling silver pendant that depicts the Uunartoq disc, or "Viking compass." Pendant: 0.3 cm H x 1.8 cm Diam. Pendant: 0.1" H x 0.7" Diam. You can find men's sterling silver and leather braided wristband bracelet 'Viking Compass' by Henry Anthony Sanny in jewelry categories such as Nat Geo Gifts Bracelets, No Stone Bracelets, Silver Bracelets, Sterling Silver Bracelets, Leather Bracelets, Pendant Bracelets, Braided Bracelets and Wristband Bracelets. Enjoy exploring these sections for other Novica treasures. Henry gives work to other silversmiths and long-time employees. Most have worked with him for more than five years. Made Sri, his head administrator has been with Henry since he started his workshop 15 years ago. She recently became a Novica artisan and is growing her own successful workshop. Henry Anthony Sanny has received 7 microcredit loans with 0% interest from Kiva and Novica, the first for $2500 and the most recent for $5000. Proceeds were used to invest in the purchase of raw materials like sterling silver and leather so he can increase production. Henry Anthony provides for the care and support of his four children. Henry Anthony provides for the education of his four children. Absolutely stunning piece of art! Beautifully made and packaged and I know my son will cherish it for years to come! This bracelet is beautiful and very well made. My husband?s family is from Norway so this is especially meaningful to him. He loves it. "GREATEST GIFT FOR A MAN"
I KNOW SOMEONE WHO IS STILL KIND OF SEARCHING FOR HIS PLACE IN THE WORLD AND I THOUGHT THIS WOULD BE THE PERFECT GIFT AND IT SURE IS! THE LEATHER DETAILING IN EXQUISITE AND THE SILVER IS SO DETAILED AND I LOVE THE MEANING BEHIND THE COMPASS IF YOU LOOK IT UP ON THE INTERNET. Henry's jewelry collections for men are influenced by his Indonesian surroundings, as well as by his admiration of Japanese artistry. Born in Jakarta, Henry's adventurous spirit found reflection in the wide variety of jobs he's had: from waiting tables in Perth, Tokyo, Amsterdam and Rotterdam, to designing chairs for a furniture company. His artistic spirit found reflection in jewelry design, and Bali became the perfect setting. "I used to live in Jakarta, but it was difficult to find jewelry that was specifically designed for men. So I decided to leave the hustle and bustle of Jakarta and move to Bali in 2002, where I could pursue my dreams and create my own collections," recalls Henry. "Designing jewelry for men has become an intrinsic part of my lifestyle," Henry tells us. "In my designs I'm often funky and chunky and I like to mix different materials such as sterling silver, leather and bone. "My goals in life are to raise my three kids, be a good partner for the artisans that work with me, and keep focused in designing men's silver jewelry," says Henry with a smile. The sterling silver leopard ring is awesome, dramatic, and powerful. Henry Anthony Sanny's skill is totally amazing. Men's Artisan Crafted Sterling Silver and Garnet Ring, 'Lion Power' Product ID: 190647 looking forward to being able to order this ring in size 11. will keep an eye out for when you will be making in this size.